Guests Comments and Photos - Orrsome Tassie Trout. "Another wonderful week of friendship and fishing, not to mention the eating with the Orr family and Barry." "Just to be here is a constant delight, whatever the fish are doing." "Such fantastic hospitality and great food with great friends!" G. P. T. (NSW, Australia). "Each year just gets better in a wonderful "oasis". My batteries are recharged - lookout world and thank you Orr's". "Fantastic 5 days fishing with wonderful cooking from Marea as always". Thankyou both so very much, I just enjoyed everything! everything! I had a great 5 days blessed with excellent weather, wonderful food, good company and good fishing but was particularly glad to see a duck billed platypus in the wild along with a quoll and wombat, what beaut animals." "Marea's outstanding cooking "every day" especially the smoked quail and Ken's different and exciting fishing days. The highlight was 'River X', a magical day and 25 fish landed was a blast. Your secret spots are safe with me." A top first class operation with thoughtful and kind folks. A big thankyou." 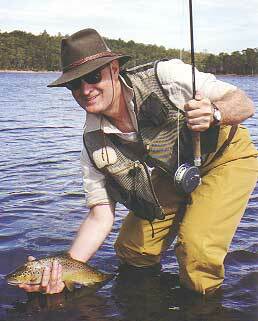 "A wonderful introduction to Tasmania - loved the fishing and the company." P. & D.B. (Ma, USA). "Thanks for your knowledge and patience, we shall return, if only for Marea's cooking." K. & T.G. (Pa, USA). "If I were younger I would move here! Genuine people, outdoorsman's' paradise, Ken you are fortunate to have such a wonderful family - I shall return!" "A wonderful place! Fishing was varied and challenging. The hospitality was superb! I'll be back!" "This has been the perfect fishing adventure for both a beginner and experienced angler. Thankyou for a wonderful grand finale to our Australian holiday." B. & M.M. (Ma, USA).